When Anna and I were first dating in the mid-1970s we lived in Oakland and occasionally went dancing with friends from the theatre where we performed during the summer. (Woodminster Theatre in Joaquin Miller park.) There was a club down near the Oakland coliseum that allowed those of us who were not yet 21 to dance to the funky music that was popular in Oakland at that time. 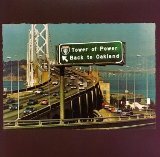 One of the groups setting the tone for the Eastbay music scene in the 1970s was Tower of Power. They released an album in 1974 called Back to Oakland, and when we decided to move back to our old stomping grounds, I thought it would be fitting to pay homage to that record by naming this humble blog after the album. There’s some good music on the disc. Check it out! When we moved to the Midwest in August of 2002 we were able to buy a small but comfortable house on a pretty nice lot in a really great neighborhood in Moline, Illinois. Moline is one of the Quad Cities that hug the Mississippi river where it runs East/West between Iowa and Illinois. The other cities that make up the quartet are Rock Island, IL, East Moline, IL, and Davenport IA. Some Iowans try to make the case that Bettendorf, IA, is one of the original four cities, but I think I have the historians on my side. The Quad Cities are a mini-metropolitan area. If you add the population of all the closely connected towns in what we think of as the greater Quad Cities, you get an MSA ranking of 132 (MSA stands for Metropolitan Statistical Area. 132 means that there are 131 larger metropolitan areas in the U.S.) For the sake of comparison, Oakland is part of the SF Bay Area MSA, which is ranked 13th. What we found when we moved here was a friendly community. We experienced rush minute instead of rush hour. The total price of a house in this area is about what you’d need to make a down payment in Palo Alto. The trees turned awesome colors in the fall. If you like chilly winters, you’d love it here. There’s nothing like a snowy Christmas to put you in the mood for a yule log and a glass of hot buttered rum. If you like a bracing morning workout, scraping the snow off our driveway is always a good way to wake up. We found music, theatre, and lots of good friends. Most everyone we know here goes to church, and it’s nice to run into people you know almost everywhere you go. Some things we didn’t find here were the terrific grocery stores and dining options that are so common in the Bay Area. There was a place that opened up in Rock Island that tried to show independent films, but he couldn’t draw a big enough crowd to keep the theatre open, so we don’t get to see the really great indie films that we got used to seeing at the Aquarius Theatre on Emerson Street in Palo Alto. The only Indian cuisine you can find here in Moline is a very small place in what used to be a Taco Bell location. It’ll do in a real pinch, but it’s not a place we go often. And, of course, we miss Zachary’s Pizza. Moline is just 170 miles from Downtown Chicago, but there’s no pizza place in town that even comes close to the delicious Chicago style pies served up on College Ave in Oakland. So, sad as we are to say goodbye to family and friends here in the Midwest, we are heading home, back to Oakland. We left Oakland almost 15 years ago. Business opportunities and a family connection lured us to Palo Alto. We spent 7 happy years on the Peninsula before embarking on our Midwestern adventure. When we decided to head back to the west, it was Oakland that had the strongest call. We found an apartment near Kathleen and Dave, just a couple of blocks from Lake Merritt in the Adams Point neighborhood, and decided it was just too great an opportunity to pass up. We’ll be near the folks, and a short walk from BART. A couple of good bus routes are within half a block of the apartment. We’ll have a Trader Joe’s about a mile to the east, Whole Foods half a mile to the west, and there’s a wonderful Farmer’s Market (year round!) in front of the Grand Lake Theatre on Saturdays that’s just a few blocks away. There are Zipcars parked at the gas station on the corner. We’re giving up a half an acre of yard and handful of old oak trees, but were gaining a vibrant, diverse, and energetic urban neighborhood. Oh, by the way, both of our boys are living in the Bay Area. Of course we want to be near them.